Continuing to celebrate our Community endeavours through highlighting our work with other charitable groups and partnerships, we are proud to update you on our partnership with other Community and Charitable groups, where we sign post those who require services in the right direction, while harnessing the benefits a wide network of partners can bring. Such incentives see us working closely with ‘Challenge 4 Change’ a registered charity that provides learning through fun and makes a real difference. C4C teach effective communication skills, team skills, inspire confidence and motivation and enable people to overcome their perceived barriers in order to progress. C4C raises aspirations and works with those members of society who are in most need through a range of challenging and exhilarating activities designed to foster self esteem and challenge perceived horizons and limitations. 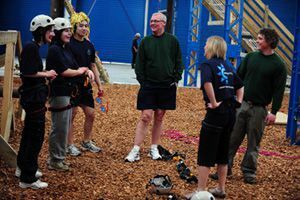 Based in Trafford Park the C4C Centre combines training and conference facilities with a 13 station aerial runway over 35 feet off the ground, a high ropes training course and a low level obstacle course. With a number of programmes, C4C cover 6 key areas: Community, Social Inclusion, Education, Sport and Charity, while undertaking some Corporate activity too. As well as physical obstacles, there is an emphasis on education and role play centred on the possible consequences of criminality, and how this can influence peoples lives in the long and short term. Given that C4C was established by Chris Whiteley, one time professional Rugby League player and Prison Officer, this emphasis isn’t surprising, though reflective of the role success through physical endeavour can play in altering perceptions and expectations and how this csan shape individuals long term life aspirations. Challenge 4 Change are an inclusive organisation, seeking to tackle a range of social issues, ranging from anti-social behaviour to perception of disabilities and attitudes to work and careers. Chris and his team have worked with all manners of people at the centre and highlight the role alternative services can offer the people of the North West, while also emphasising the role a network of partners can play. Chris says, “Since C4C started in 2009 Salford City Reds have played a key role in our development. Whether it be the playing squad coming for a burn out in pre-season, or the Foundation involving us with their community work to eventually us combining to make a funding bid extra special. Being able to have a partner with the wealth of experience and knowledge the Reds possess has been one of the essential ingredients of us starting, enduring and hopefully surviving these hard economical times. We will continue to nurture this vital relationship with the Reds and in the hope it will grow even better in the future”. Given the work Chris and his team put into their activity, and the difference it makes to people in Manchester, Trafford, Salford and the North West who may be beyond the reach of traditional support systems, continuing to work with C4C is something we at SCRF are committed to doing.